Last year was packed with activity as the hub went from a concept to a funded project, to a social enterprise. You can learn all about this journey in these documents we have produced. 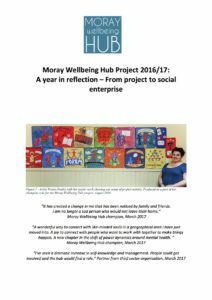 Top Line: Our co-productive grassroots approach to building a sustainable change in Moray around mental health was a great success. Our work shows that using life experiences as a catalyst to create change around mental health stigma and self-management of wellbeing is an effective approach. Recommendations: Our findings need a stronger evidence base to support others to follow this project’s example, but it is reasonable to expect that by using a values-based, peer-led approach based on human rights we can create healthier and happier communities. Activity: From April 2016 to March 2017, with funding of approx. £52K from core funders ALLIANCE and See Me, we recruited 101 champions for the MWH project and ran 7 training courses for this group, ran 15 community events open to all, contributed with 68 opportunities for outreach, and our communications reach was over 100,000 people. Impact: Our champions felt more enabled as a result of being involved in the hub with 68% feeling more able to make a change in their community, 84% feeling better able to provide other support, 77% better able to self-manage their wellbeing and 64% more aware of their self-stigma. Research: A significant quantity and quality of data have been collected, mainly through champions and partners reflections, using a Participatory Action Research approach. In the future, we aim to explore how this data could be used more widely to provide evidence to support a change in communities around services, citizenship, inclusion, education and empowerment of individuals. 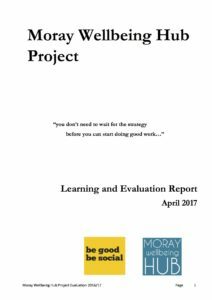 Project to Social Enterprise Report. If you like images – Check out our Prezi Presentation. We aim to come back to this very soon and pop some audio on it to make it easier to understand. 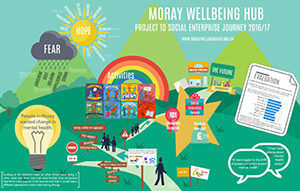 If you like reflection and photos – check out the Project to Social Enterprise Report. It’s not too long and is packed with quotes from champions and partners about what change our work created. If you like an evidence base – the Independent Evaluation Report is a great place to pick up more quotes, some nifty charts and our key learning points.